Discussion in 'Luthier's Corner' started by Satellitedog, Dec 5, 2016. Hey folks! I've brought up this topic in recent weeks already, but I think it will be easier to keep all information - outgoing and incoming - in one thread. I had some issues with it from the start, mostly cosmetic. The poly finish was applied too thickly for my liking, softening the fine contours and bevels noticeably, and likely dampening the resonance of the body to some degree, although I was not unhappy about its res. properties, and it has very healthy sustain too. The weight was above my expectations (I've been beaten to other white MIJ SG auctions before, so I jumped on the opportunity too quickly, and forgot to ask about this, wrongly assuming all SGs are featherweights) at 7.6 lbs. Not terrible, and I've gotten used to it in the meantime. The guitar is built of some kind of mahogany, either African, or sapele or perhaps some other mahogany type/related/looking wood that was available for mass production 25-28 years ago, as evidenced by a small chip-off in the control cavity. The biggest annoyance after getting used to the weight still remained though. The beveling and the shape of the horns was not quite right for an early '60s SG copy. Close but not deep enough, not pointy and clean enough (the finish may add to this observation, but we'll only know once it's off the guitar). Also the horns are more like modern day SGs, with the cold-chisel tips, not the shallower pointier '61-65 type. I like both, but only when done crisply. This photograph is not from a perfectly vertical angle, so we can see the inside of the upper horn, but regardless, it is a bit stubby and thickly covered as is. So after contemplating selling the guitar and buying something more to my liking for a serious markup, I go a quote that was good enough, and decided to just have it turned into a real keeper. Work is underway as I'm writing this post. -repair a hairline crack in the control cavity wall, so it doesn't ruin the new finish, or get worse. -reshape the horn bevels and point thickness to resemble a '61 SG. This will include deepening the cutaway bevels and reshaping their curves on both horns to match the originals as much as possible, and removing some thickness through re-beveling the outsides. -strengthen the body contours and the "shoulder" slope at the neck joint by sanding/shaving (the horn reshaping will take care of a lot of this) and shave the neck-heel and body joint ever so slightly to get the slope really crisply defined. -reshape the open-book detail of the headstock to match a median-Gibson outline. This means slightly softening the two humps at the "spine" of the book, slightly lowering them, but we won't change the faceplate, it remains a Greco. -do a refinish that is as thin as technical circumstances allow a solid white finish to be, done in polaris white/olympic white, but no artificial top coat yellowing. He'll likely be using an acrylic automotive paint. I'd like to go nitro, but no decision has been made, and while I love the look of weather-checked nitro, pristine, well applied, thin finishes of both nitro and poly are practically identical, also modern nitro lacquer contains a lot of plasticizers/elasticizers to prevent rapid deterioration, so I'm not sure it would age as I'd like it to anyway. I hope to take pics of most phases of the work. Right now the control cavity crack is being repaired, and the finish stripping comes next. dub-setter, Notes69, grausch and 1 other person like this. I'm all eyes ! Quite a undertaking for such a nice as is SG. Thank you! The changes will be only as big as they need be, mostly adjusting the bevels to be between original '61s and the modern VOS reissues, which have that standardized but very crisp and geometric look. I hope it goes well. I would say just play it and find it's voice. In the process of trying to make it something it isn't you could destroy the Mojo it already has. Nice looking Axe by the way. I played it a lot from June to November (played it so much I hardly played my main axe). I like its voice and don't think it will lose its mojo, since it didn't have much of that (unlike my main guitar), it is however a perfectly decent guitar, plays well, sounds decent (pickups can be changed after all), but not fantastic or sensationally exceptional. I expect it to feel and sound more alive after the thinner refinish, once it loses all that plastic lacquer. The re-sculpting won't take too much off the body mass, the weight will probably still be slightly over 3 kg/7 lbs and the already great sustain should be somewhat improved with the crack at the control cavity wall repaired. Essentially it will become more similar to an ideal SG than it already is, which should be nice. I didn't go to the workshop, and didn't talk to the luthier in the last two weeks, so no updates, but I plan to see him this week. Tomorrow morning I'll be visiting the luthier, seems like the interesting part of the work can begin at last. Will be taking pictures and posting them as soon as I get back home. Okay, got back from the luthier, and things are moving along fast at last! The guitar has been stripped to the base coat (the luthier started by sanding, but went with heat-loosening the finish since I told him not to keep any of the original colour) and will be sanded down further, to remove most of that as it's still pretty noticeable. Please take this into consideration when looking at joint-lines, the milky, hazy, flat layer of the base coat clouds the wood underneath. First off, the body contours and bevels are actually a bit soft, so it will be necessary to scrape or sand them crisper, even where they won't need depth or shape adjustment. Looking at the bare wood, some production quirks of this particular Greco have been revealed to a degree of surprise. The three main pieces of body wood are very nice red hued mahogany of some kind, honestly the guitar could even work with a translucent finish, they are well matched. However it turns out they glued a very small fourth piece of mahogany on the outer edge of the lower bout to get to the desired width, which has a lighter color. I don't really mind since it's really just 1/3 inch or so wide and it was always going to be a solid color. 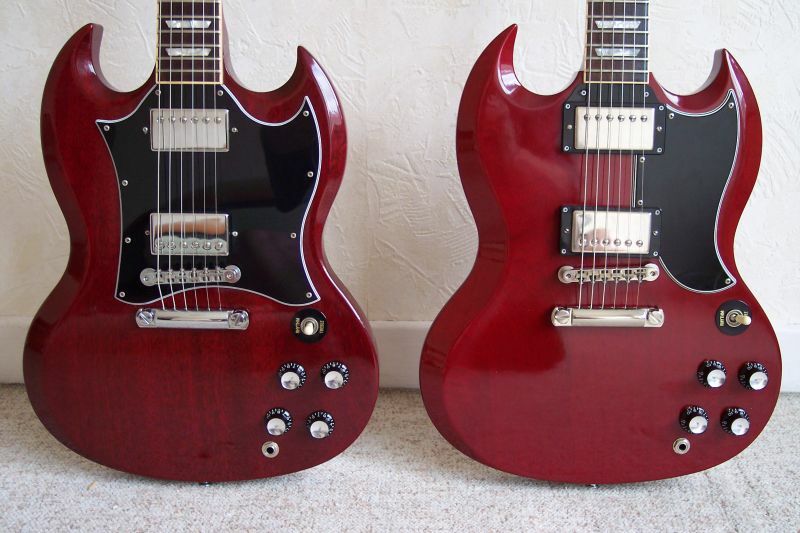 And lets not forget that in recent years Gibson have been painting their low end SGs with a burst top completely black on the back and sides of the body, so who knows what's going on under that... It doesn't seem to affect the sound much. The headstock is scarf jointed, but also has side-wing pieces, which seems a bit overkill on the cost-cutting front, but at least it's a structurally stronger joint than a straight scarfed one, since the wings reach over beyond the scarf joint line at the base of the headstock, and are glued to the neck portion too, so the glued surface is larger, and there's also more mechanical support. Anyway, the neck is resonant, so it's alright. atop the separate heel-piece which gives most of the mass of the long tenon. It could be a weird, but practical sandwiched tenon solution, but I don't know what the thinking behind the routed front was. Any ideas? I thought it could be a separate block of mahogany glued to the two halves of the tenon, the neck and the heel/tenon piece, to give more stability, but the luthier thinks it isn't. Should I have those holes filled with triangular dowels? Structurally it is sound, but it's weird and ugly. The guitar weighs 5.9 lbs now that it's been stripped of almost all the hardware (tuner bushings were left alone for the time being), and the original poly finish (which my luthier collected and the flakes/chips weigh about 0.5 lbs), and feels really nice and resonant. It will lose more weight with the re-sculpting and further sanding of the base coat. We measured every piece of hardware for future replacement prep, and it seems to be built with imperial measurements, which I find surprising for a Korean guitar. Anyway, we've marked the planned changes with a pencil, and I'll be drawing in the new bevel and body contours digitally as a more precise guide in addition to those and the reference photos of Gibsons. I'll try and borrow a better camera for the next session, once the re-sculpting is underway, probably before X-mas. dub-setter, JCarno, Dave Johnson and 2 others like this. Thanks for those pictures! Very interesting to see it stripped. I'll be checking out the progress! Thanks, the reshaping will be the most interesting part, as the guy is an expert at finishing guitars. I'm currently preparing an 1:1 comparison of a historic pickguard with the Greco's and prepare a blueprint so he can get the lower cutaway bevel and the lower body contour right. The upper horn's top side edge will be modeled after Delboy's beautiful '1963 standard. His was the only photo from the right angle, and lucky for me, his SG is perfect. However, the Greco has a slightly deeper carve just above the waistline on the upper horn, so there's a bit less wood, so the paralel part of the side strip will be somewhat thinner too. underside - the sides are tricky, as I have no blueprint or original SG to measure and follow, just the reference photos I found online. These lines may differ eventually. Open book carve shape comparison with two vintage Gibsons - "fejforma" is Hungarian for headstock=fej forma=shape. dub-setter, JCarno, bwotw and 2 others like this. Very cool stuff. I would just leave the headstock alone though. Only the open book outline will be adjusted to be less exaggerated, and be more like the original, the faceplate remains as is. That's gonna look awesome man!!!! Now that the guitar is on bare wood mode, maybe it's time to reconsider relocating the pot knobs and the switch?? If you take a look at SGs with the ssmall pickguard, you'll see that the knobs and the switch is closer to the edge rather than yours. Yours look like the position thats on the full pickguard. Not gonna change anything in tone, but since you got into all this fuzz maybe try this too? Cant wait for the finished result. Thanks, I don't mind the current layout, it's close enough not to bother me, but I might consider it. First though I'll have to ask the man to calculate all the fees and materials, as the list of changes has already gone well beyond the first draft. If it's within reason, I could ask him. Do you mean the Bridge Pup Vol and Tone knob positions? Honestly, I don't quite see a drastic difference. PermissionToLand, ypnos and Satellitedog like this.